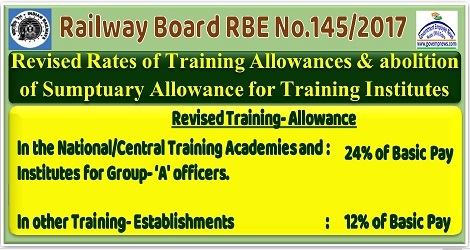 7th CPC Revision of Training Allowane and abolition of Sumptuary Allowance for Training Institutes - Railway Board (RBE No. 145/2017), Government of India (Bharat Sarkar), Ministry of Railways (Rail Mantralaya), (Railway Board), RBE No. l4572017, No. E(MPP)2012/3/28, New Delhi, Dated o 6.10.2017, The General Managers, All Indian Railway and Production Units. The Director General, NAIR, Vadodara. The Directors, IRICEN,Pune, IRIEEN, Nasik, IRIMEE, Jamalpur, IRISET, Secunderabad, IRITM, Lucknow, JRRPF, Lucknow. Sub:- Revision of rates of Training Allowances and abolition of Sumptuary Allowance for Training Institutes. Kindly refer to Ministry of Railways’ letter Nos. E(MPP)/2005/13/2 dated 22.08.2005 (RBE No. 139/2005) followed by E(MPP)/2008/3/18 dated 20.10.2008 (RBE No-156/2008) wherein Ministry of Railways had communicated that the training allowance is to be paid @ 30% and @ 15% of the basic pay to the faculty members, for imparting training to Group ‘A' Officers and to Group ‘C’ & ‘D’ staff respectively on Centralised Training Institutes and various other training Centres on Indian Railways, respectively. 4 Training Allowance will be admissible to the faculty members without any ceiling of 5 years and standard cooling off period between tenures will apply. 1. FA&CAOs, All Indian Railways and Production Units. 2. The Dy. Comptroller & Auditor General of India (Railways), Room No.224, Rail Bhawan, New Delhi. (with 40 spares).